A while ago I wrote an article that http://www.codeproject.com/Articles/875165/To-Repository-Or-NOT which talked about how to test repository classes using Entity Framework and not using Entity Framework. It has been a while and I am just about to start a small project for one of the Admin staff at work, to aid her in her day to day activities. As always there will be a database involved. I will likely be using Owin and OR MVC5 with Aurelia.IO for Client side. 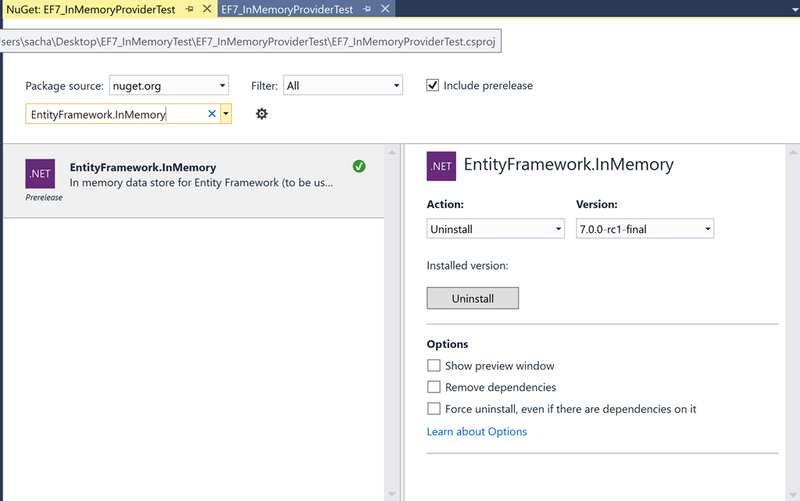 Not sure about DB, so I decided to try out the In Memory support in the yet to be released Entity Framework 7. So lets have a look. The first thing you will need to do is grab the Nuget package which for me was as easy as using the Nuget package window in Visual Studio 2015. The package name is “EntityFramework.InMemory” this will bring in the other bits and pieces you need. NOTE : This is a pre-release NuGet package so you will need to include prelease packages. string qualifications = Qualifications.Any() ? Description = "Bsc Hons : Computer Science"
Description = "Msc : Computer Science"
Description = "Bsc Hons : Naturapathic medicine"
Quite happy with how easy this was, and I think I would definitely try this out for real.